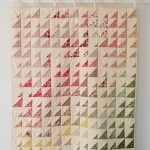 Purl Soho founder Joelle Hoverson’s Last-Minute Patchwork + Quilted Gifts is at least ten years old (! ), but the projects inside are still as fresh as ever. 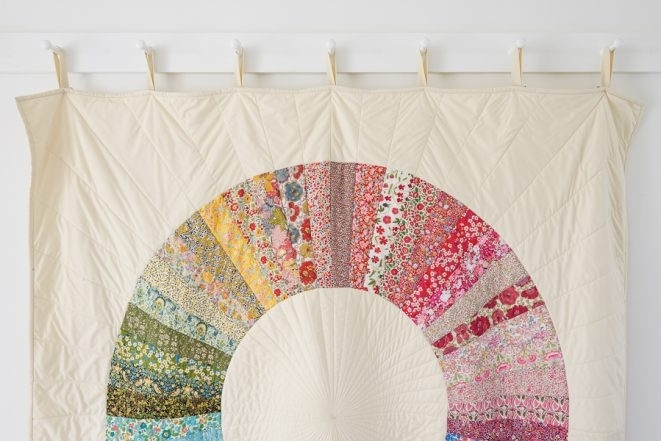 The super popular Color-Wheel Quilt looks just as amazing as it did in 2007 and remains one of our most quintessentially “Purl Soho” projects. Sadly, Last-Minute Patchwork + Quilted Gifts is no longer in print, but happily, we now offer the Color-Wheel Quilt Pattern all on its own! Its new incarnation includes templates, step-by-step instructions, and is available as a hard copy or PDF download… Saved from the obscurity of out-of-print books! 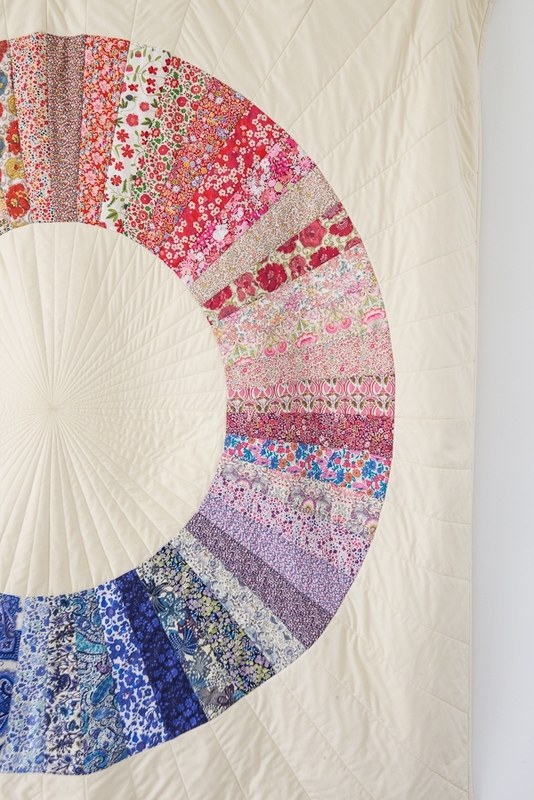 The Color-Wheel Quilt uses 52 different prints that run the rainbow, and if you’re talking about color and prints, there is no fabric better than Liberty of London’s Tana Lawn. 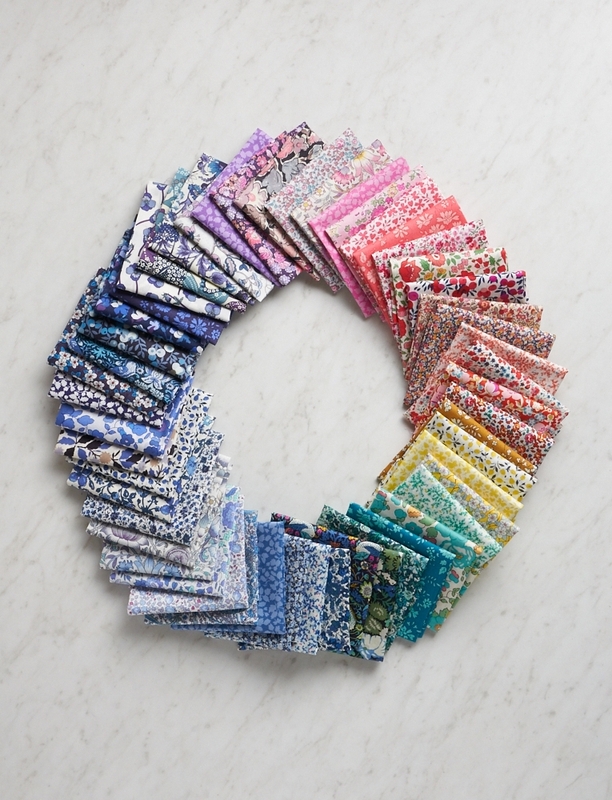 We’ve put together a beautiful selection in our Liberty Color-Wheel Bundle, so full of fresh energy and joy, we’ll probably be talking about the Color-Wheel Quilt for another ten years! Main Fabric: 7¼ yards of 45-inch wide cotton (for background, binding, and quilt back). 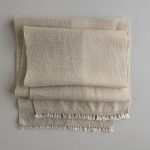 We used Moda’s 200-count Natural Muslin, 45 inches wide. 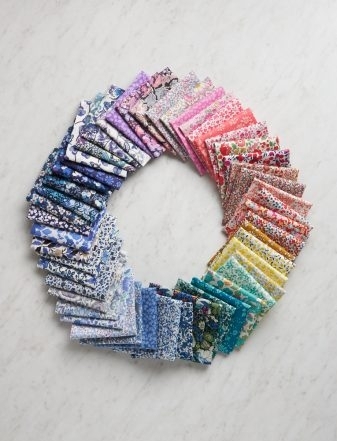 Color-Wheel Fabric: 52 different-color cottons, at least 4 x 12 inches each. 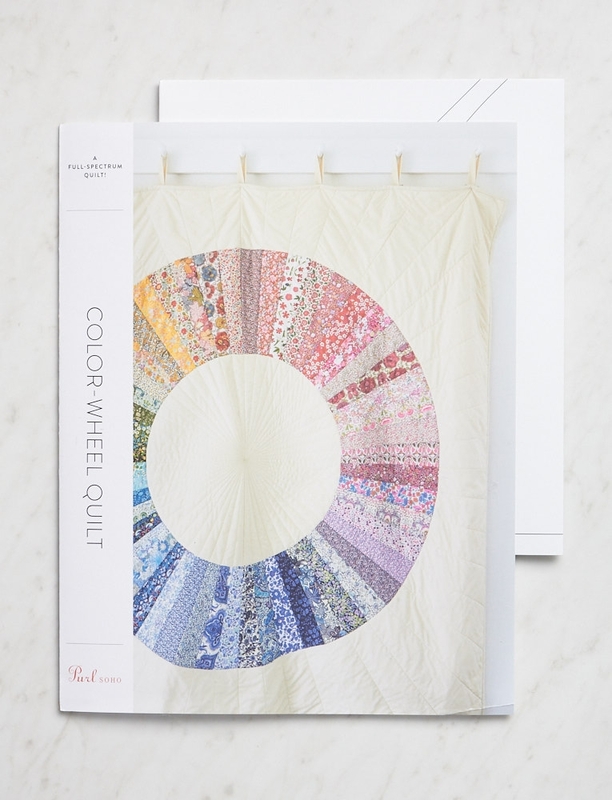 We used Purl Soho’s Liberty Color-Wheel Quilt Bundle. Two large spools of thread. 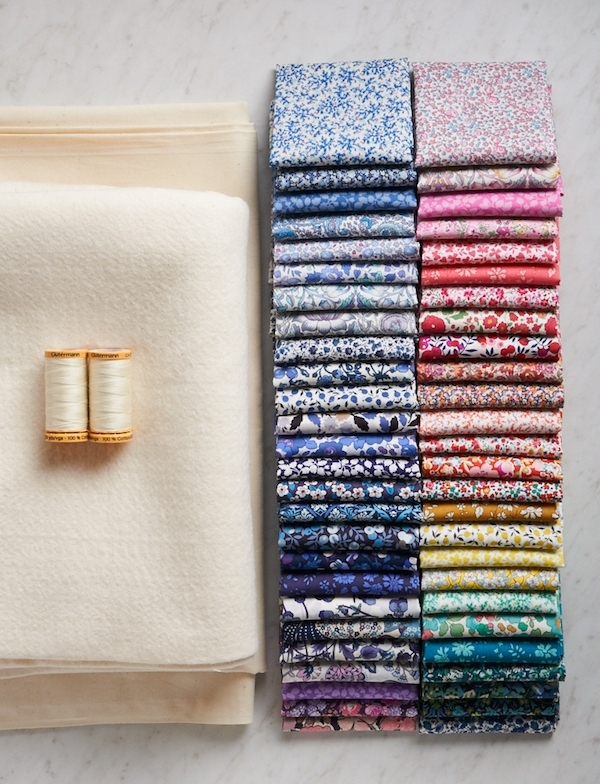 We used 274-yard spools of Gutermann’s Cotton Sewing Thread in color 1040. Thinnest loft cotton batting. We used Quilter’s Dream’s Cotton Batting, Request loft, Twin size. Our Color-Wheel Quilt Pattern comes with templates and is available as a hard copy or PDF download. Could I just have the pattern and templates, as I have plenty of materials of all colours that I can use. Thanks for writing in! 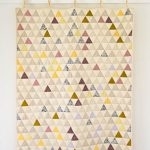 The pattern for this lovely quilt can be found in Joelle’s Book Last Minute Patchwork + Quilted Gifts. Beautiful. I’m wondering, I know how to sew but never made a quilt. Approximately, much time should it a take for a newbie to complete a project like this? Thanks! Thanks for writing in! 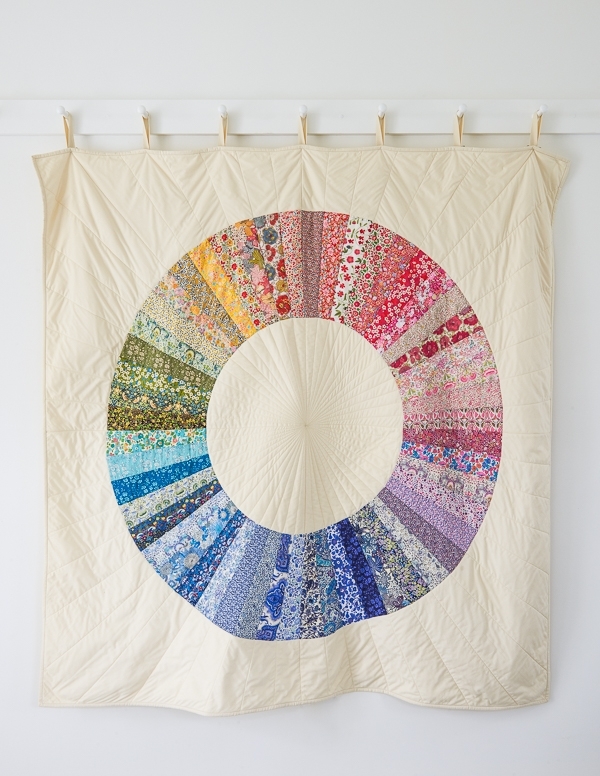 This lovely quilt appears in the “12 hours or more” chapter of Joelle’s book. This means that we estimate that it will take in excess of 12 hours to complete. That said, every person works at a different pace and thus it is difficult to estimate how long it might take an individual to make any given project. This quilt is breathtakingly amazing…. There are no words to express how inspired I am! I have just taken up sewing again so I vow to get good enough to one day attempt this gorgeous pattern. This is a beautiful quilt. 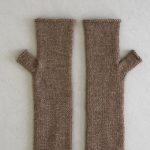 I wasn’t sure what is included in the bundle when I went to the ‘buy now’ page, is it just the fabrics, does it include the pattern, threads and batting, do you have to buy the book separately? Thanks for writing in! 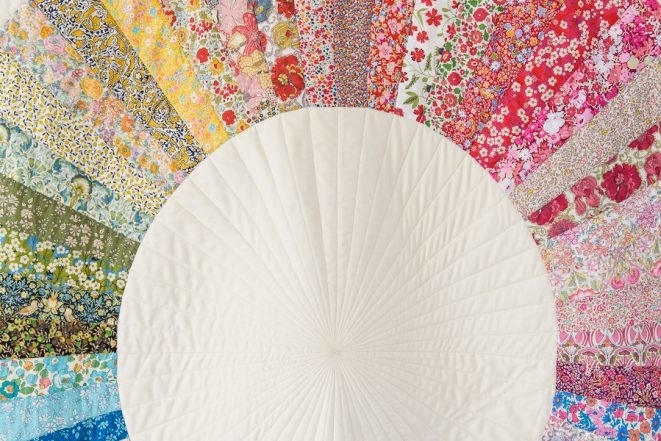 The bundle linked here is for the Liberty Color-Wheel Quilt Bundle in Fat Sixteenths. To complete the project, you will need to purchase the bundle as well as all of the other materials listed in the Materials section including Joelle’s excellent book! I have all the things to make this quilt. It is my next project. However, you are pretty adamant about pre washing. Can I pre wash the Liberty Squares without tremendous fray? I have had a lot of trouble pre washing precuts. Maybe just rinse them? Also it will be a challenge keeping them in order, but I can make a key I guess. . . Thanks for writing in! We do suggest washing and pressing all of the fabric. If you are concerned with fraying, I would suggest washing the smaller Liberty pieces in a lingerie bag on the gentle cycle. This should minimize fraying. To keep the fabric in order, I would suggest laying the fabric out in the order that you wish and taking a photo with your phone or camera! That way, you can reassemble once the pieces are washed. I absolutely love this pattern! I’ve made two of these quilts and have the color wheel sewn together for a third. 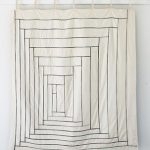 I’m hoping to make this as a functioning full-sized quilt with some drop on the sides so I can tuck it under a mattress. Any suggestions on how much additional white fabric it would take to widen/lengthen the quilt a bit? Thanks for writing in! 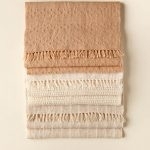 For a queen size quilt of about 90 x 108 inches, I think that you will need about 3 times the amount of muslin. 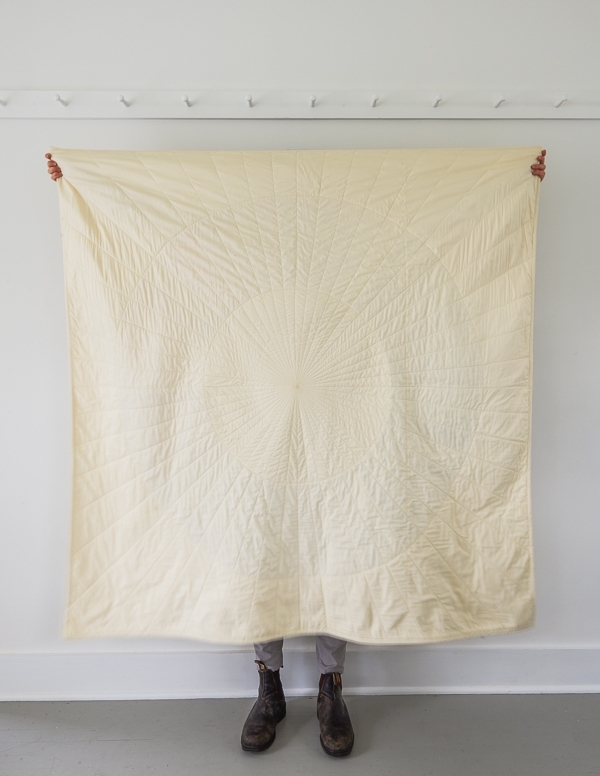 You may want to subtract the yardage that you would use for the back from the the yardage that you will calculate for the overall quilt and purchase a roughly 3 yards of 110 inch wide muslin (for a 90 x 108 quilt) so that you do not have to piece the back together. In my estimation, you will subtract 9 yards from the overall amount to do this! Is this a novice project? If not, is there one here that is? Thanks! Thank you for reaching out! I would say this project is a bit more advanced. If you are looking for a first time quilt project I would check these patterns out Our https://www.purlsoho.com/create/2015/07/06/learn-to-sew-a-patchwork-quilt-kit/ or for step up from the basics Our Modular Blocks Quilt.